How are you learning about the most important, essential, and current concepts of information technology? 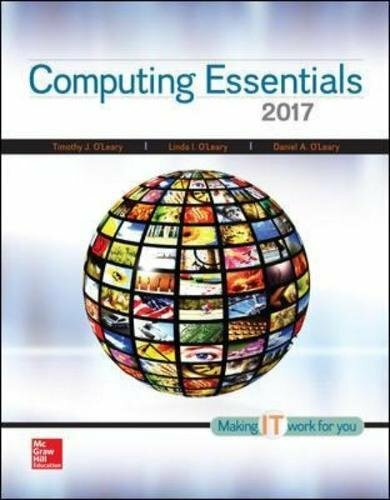 Computing Essentials 2017 Complete allows you to Make IT Work for You by presenting the effect of information technology on people, privacy, ethics, and our environment. Current examples, references and exercises allow students to be successful in understanding today's role of Computer Information Technology. This definitive approach provides the essentials students need while bringing them a full digital solution through Connect. Connect is a teaching and learning platform that is proven to deliver better results for students and instructors. Connect empowers students by continually adapting to deliver precisely what they need, when they need it, and how they need it, so class time is more engaging and effective. O'Leary; Computing Essentials 2017: Make IT Work for You!